PERIOD OF RECORD.--Discharge records from October 1964 to current year. 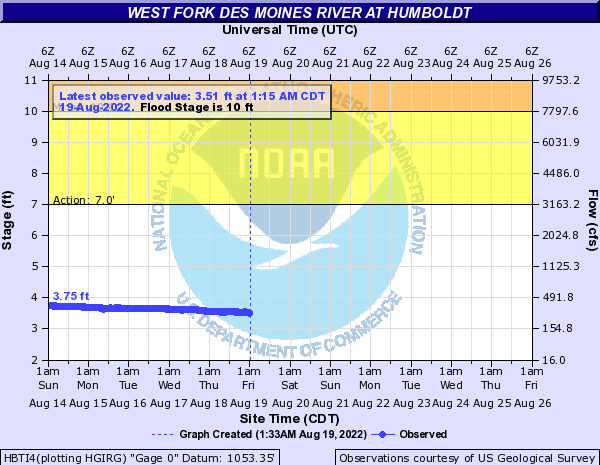 Prior to October 1970, published as "West Fork Des Moines River at Humboldt". GAGE.--Water-stage recorder. Datum of gage is 1,053.54 ft above National Geodetic Vertical Datum of 1929. Prior to October 3, 1966, non-recording gage at same site and datum. REMARKS.--Daily non-recording gage-height readings available for period March 7, 1940, to September 30, 1964. Discharge not published for this period because of extreme regulation of streamflow by dam 700 ft upstream. Power generation and streamflow regulation discontinued August 1964. Low-flow discharges occasionally affected by minor regulation at Reasoner Dam, 0.84 mi upstream.